With its new iSA decentralized (cabinet-free) motion controller, AMK is offering an IP65 machine frame mountable motion controller without the need of a control cabinet. 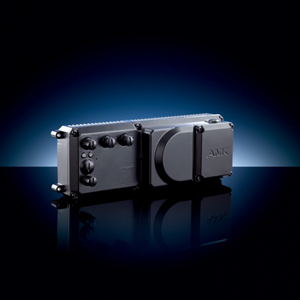 The decentralized motion controller has a 3-phase power connection and provides the DC-bus supply for servo drives, integrated 24 V supply, and control intelligence including motion control. The compact design of the iSA is based on a real-time Linux operating system. The real-time capability of the system is ensured via EtherCAT. With cross-communication in master-slave operation, the controller can also be used in combination with other controllers as a gateway for Ethernet/IP and Profibus. The iSA decentralized motion controller is ideal for modular machine construction. Subsystems only have to be connected to the 3-phase power and incorporated in the control system via the real-time Ethernet interface. The IP65 protection class ensures flexible design possibilities.